I received my first Love with Food box finally, it was a bit delayed due to snowstorms. 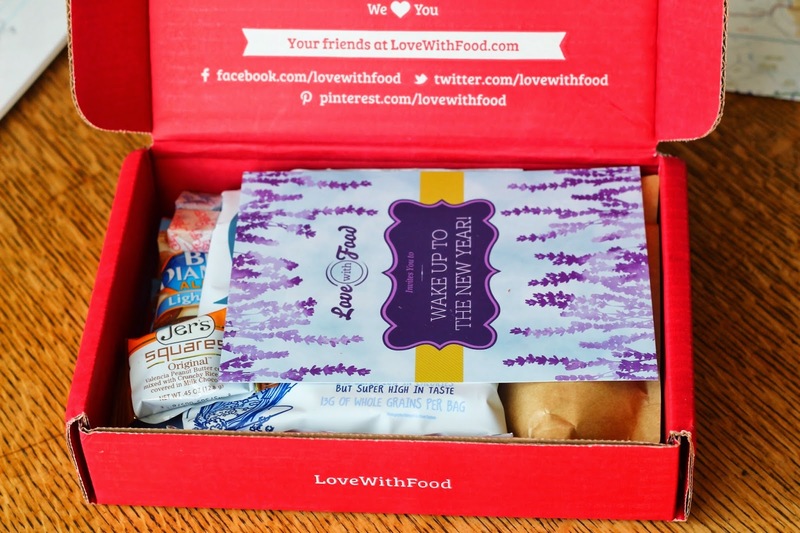 Love with Food is a snack box that contains organic natural snacks every month. I had seen a few reviews of it, and finally found a promo code to get my first box for $2 so I had to try it. 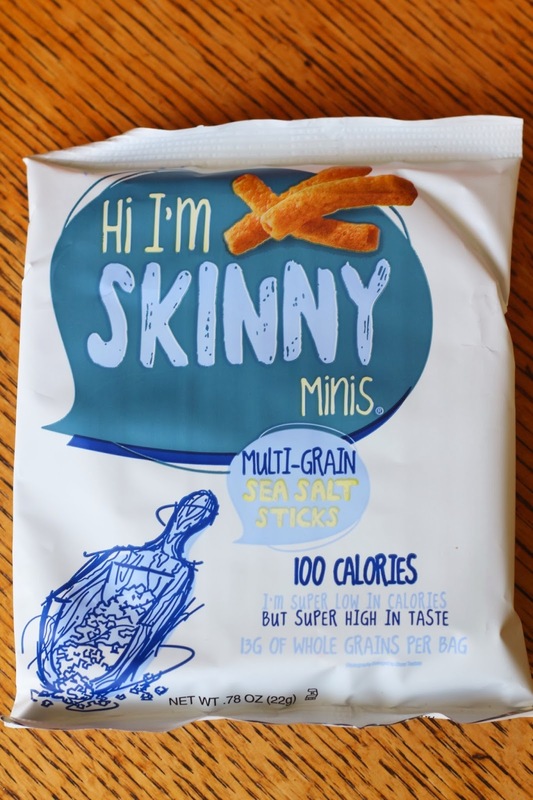 They have 2 different sized boxes, I received the Tasting Box, which is $12 including shipping, but they also have a larger Deluxe Box, which has double the amount of snacks for $17 a month, I don't know what the shipping fee is on the larger box. 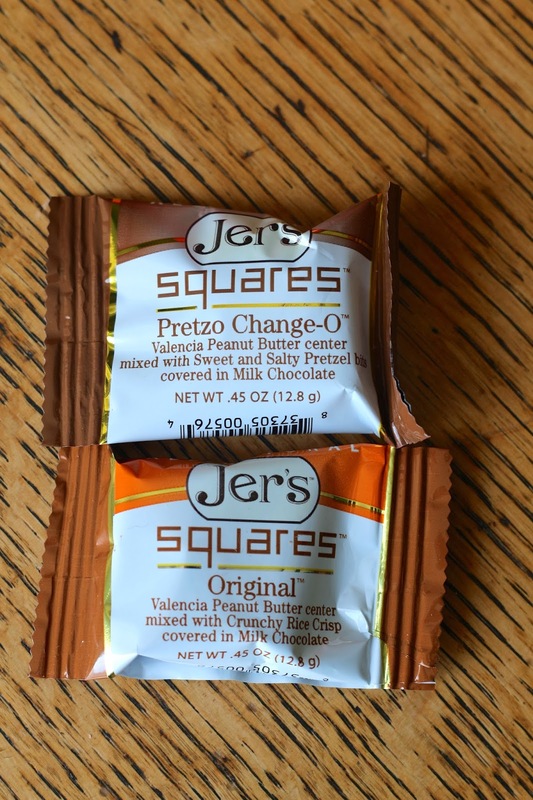 Jer's Chocolate Original Milk Chocolate Square and Pretzo Change-O - ($1.66 total) These had peanut butter inside which I wasn't expecting, and kind of tasted like a creamier Butterfinger. Pretzel one just added pretzels to the peanut butter. They were good, I'm just not a big sweet fan lately so I shared these. Cornfields Hi I'm Skinny Sea Salt Flavor - These were crunchy and pretty good. Not for everyone though. 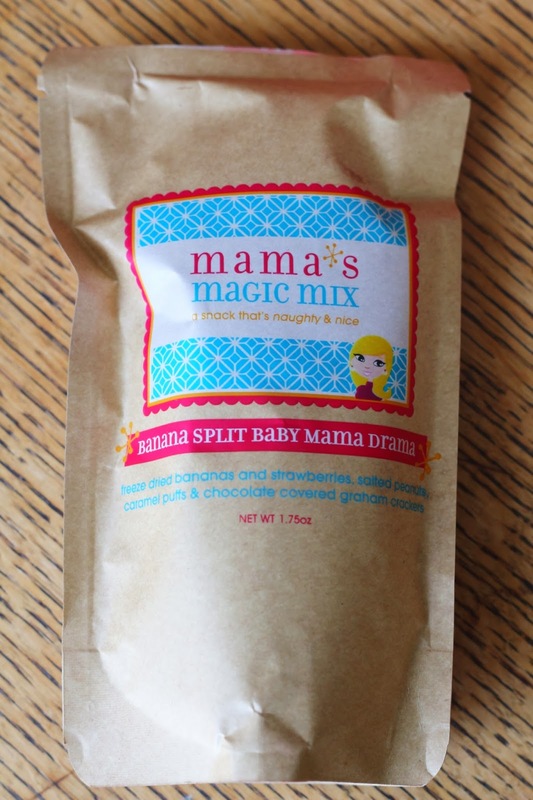 Mama's Magic Mix Banana Split Baby Mama Drama - I'm not sure quite what I was expecting with these, but they had some crunchy puff things in them that were very good and the dried strawberries were not bad. I've had worse dried strawberries. Fun fact: strawberries are my favorite fruit, we get so many pounds of them during the summer, and I've always thought it was such a waste to dry them. But these were pretty good! 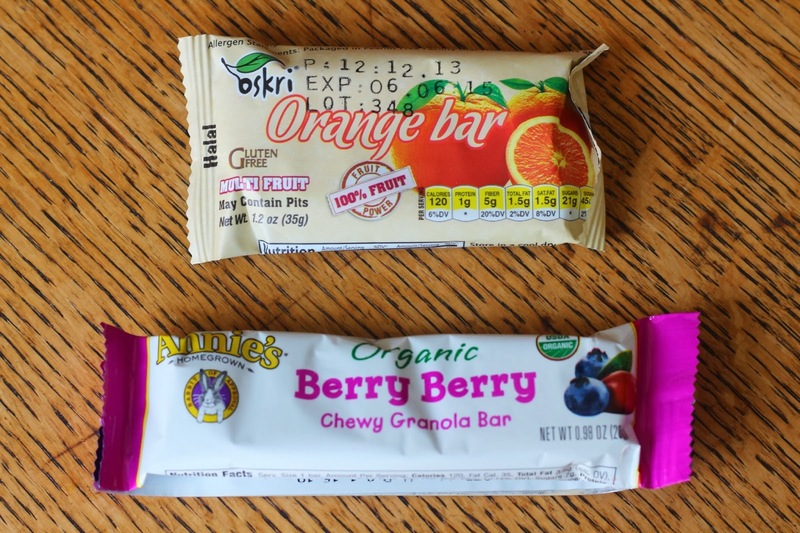 Oskri Orange Fruit Bar - ($1.19) This bar was too much for me. Tasted like 3 oranges concentrated into bar form, rind and all. Really bitter. Annie's Homegrown Organic Berry Berry Granola Bar - This was a good granola bar, not too sweet, great berry flavor. 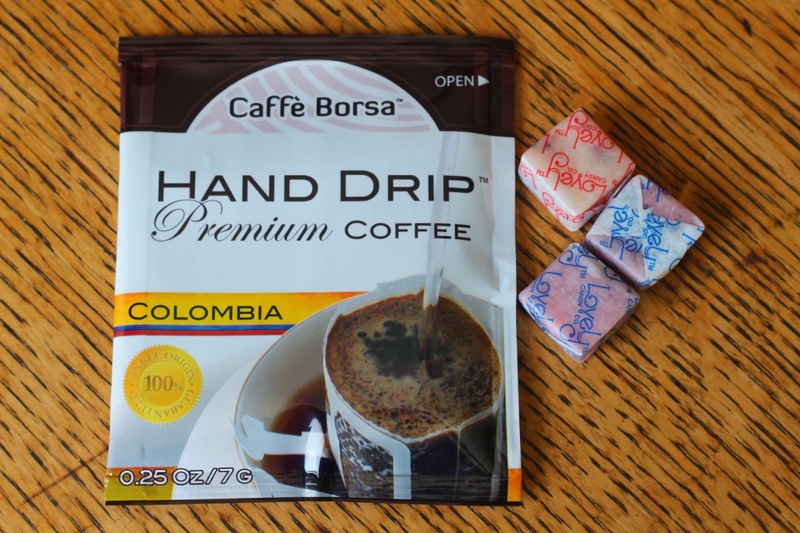 Caffe Borsa Columbia Supremo - ($1) I was going to take some photos of this brewing, but I made the biggest mess. Coffee and filter are supposed to attach to the side of the mug while you, key word here is "slowly", pour water over the coffee grinds. Well I managed to make the filter fall in the mug, burn my finger, and get coffee and grinds all over trying to make this. I did manage to filter some through another coffee filter and at least try it. I was so sad I mucked this up, because it wasn't bad! 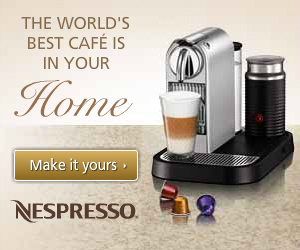 If I wanted some good, easy coffee while traveling I might get a couple of these! Lovely Foods Superfood Chews - These little fruit chews were a bonus in everyone's box I believe, and they were good! Kind of like a Hi-Chew if you've ever had one of those, but naturally fruit flavored instead of artificial. Blue Diamond Lightly Salted Almonds - ($1) I grew up in California and Blue Diamond almonds are in pretty much every grocery store here. These were good, didn't have salt all over them to get your hands messy if you were pouring the bag into your hand. And I think Blue Diamond almonds have the best flavor of any other almonds I've tried, just a little too expensive for me to buy all the time. But maybe some of these snack packs would be good to have on hand. 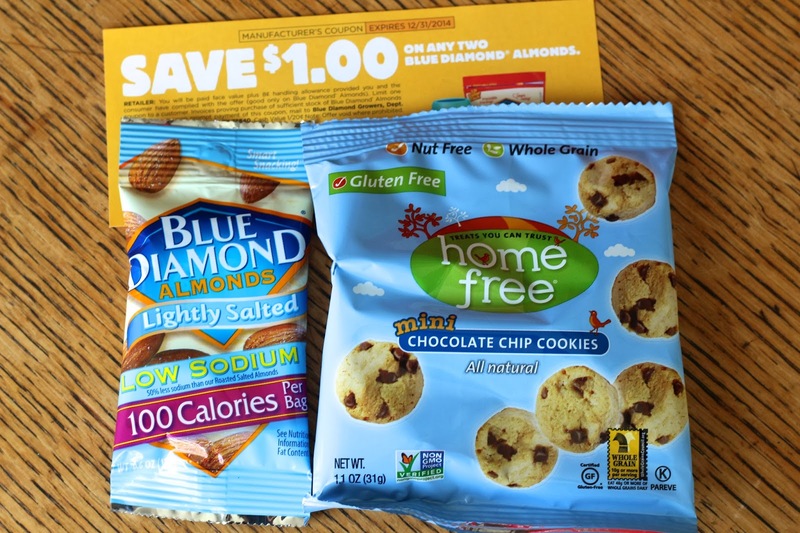 They also included a $1 off coupon to buy your own Blue Diamond almonds, which was nice. HomeFree Chocolate Chip Cookies - ($2) These were also good, definitely didn't taste gluten free, which I always associate with "bad tasting". Ehh, I probably wouldn't buy again, but they were a nice snack. For the $2 that I paid for this box, I definitely feel like I got my money's worth! It makes it nice because I get to try before I buy, and if I do like it I can find at the store. I definitely enjoyed getting this snack box in the mail, but for right now money is a little tight, so I won't be continuing to subscribe to this box. I really would like to, especially since I was a little hesitant about this box when I saw some spoilers, but it all was very good. I hope that when I do have some extra money, I can resubscribe. If you're like, "Well, I want to try this box! 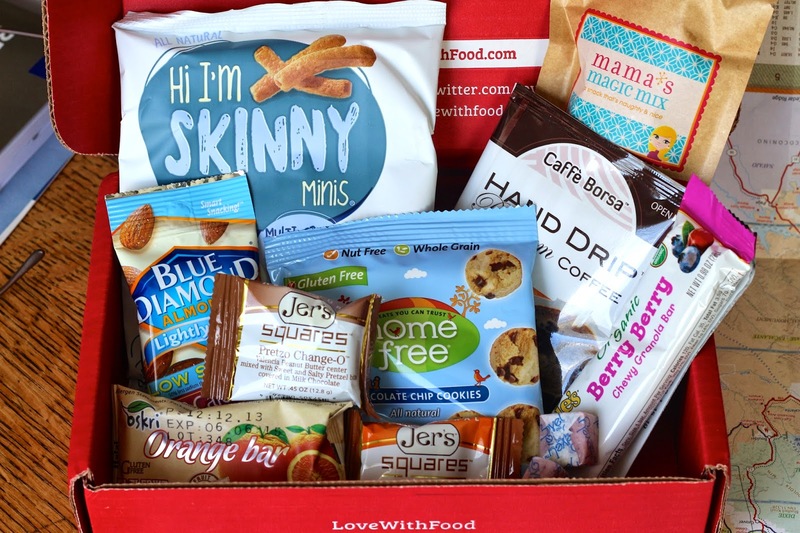 I don't want to pay full price for it though" or you're generous enough to use my referral links to subscribe to your own Love with Food so I can earn some points, you can sign up here, and use code YUMMY to get your first Love with Food tasting box for only $2 like I did! 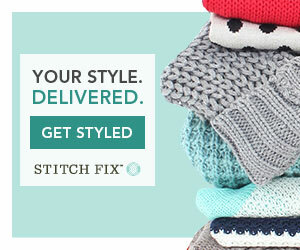 Order by 2/1 to get February's box. 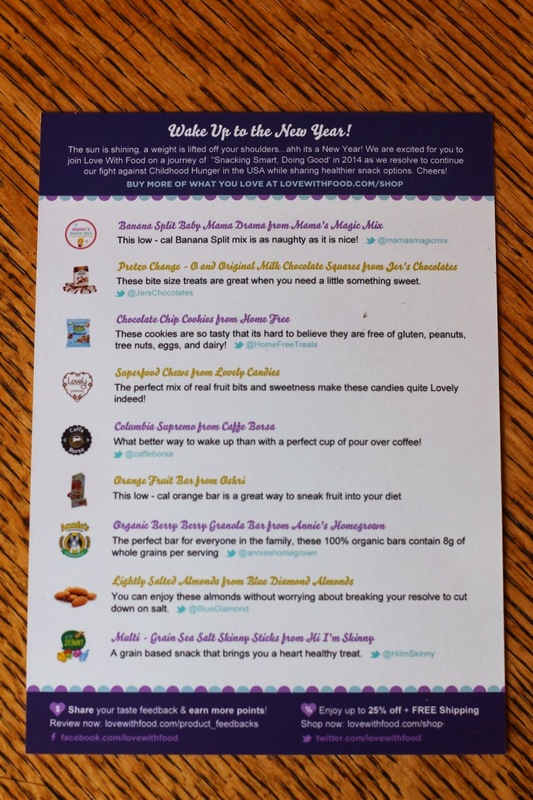 Do you subscribe to Love with Food? What did you think of this month's box? Let me know in the comments! For all other Love with Food reviews click here. I love your review. This box was really great for me. The only thing I wasn't a huge fan of was the orange bar. The flavor was okay, but the consistency wasn't too great. Yep my exact thought! 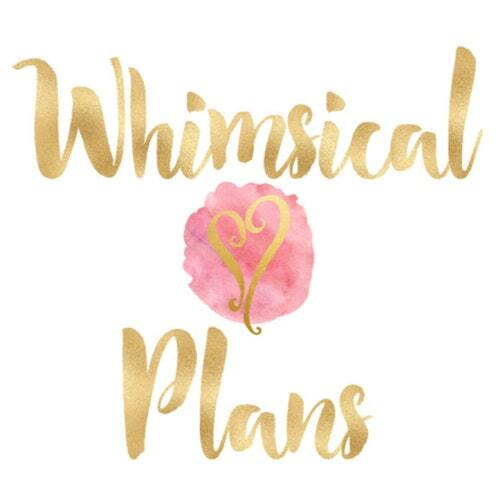 I wish I could keep subscribing because I was pleasantly surprised by the products.